The On/Off Coffee mug lets you know if your coffee is hot or cold. This mug indicates its current state of mind when you pour a hot beverage into it. 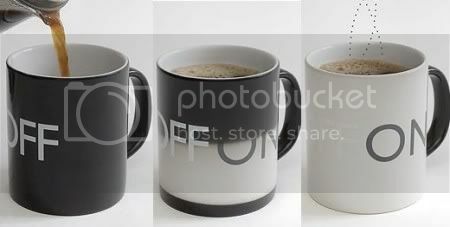 When the mug is empty it shows a black “OFF” display. When you pour a hot coffee or any other hot beverage in it, it gradually transforms from the black “OFF” display to “ON”.